Ideation is the process of coming up with new ideas, and it is the first part of the IPESSI process. If you are an entrepreneur, ideation is essential, because you need an idea to start a business. Sometimes, you start implementing one idea, and it is not working out as you hoped. So you need ideas to tweak your idea, or you need a new idea. Sometimes you and a friend want to start something, and you need a good idea to get started. You start with a blank sheet of paper. You, as an entrepreneur, can work on almost any idea you can imagine. 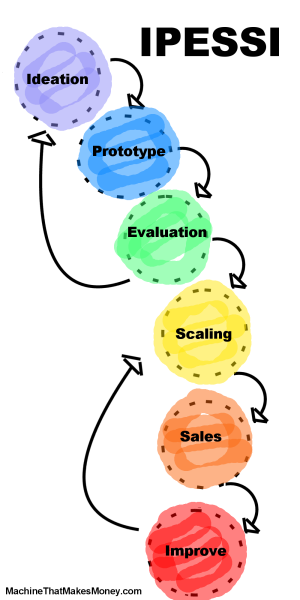 So you run the IPESSI process, and the first step is ideation. You develop ideas, choose an idea, prove that there is a market for it, prototype the idea and build a viable business around it. Your product ideas do not need to be this elaborate, obviously, but this is an example of how big entrepreneurial ideas can get. Nest with their thermostat went through almost exactly the same process. If you have ever seen the product called Tile, it did too, getting its start on Kickstarter. To be an entrepreneur you need to develop and settle on a cool, interesting, disruptive idea. Therefore, you need to ideate. For entrepreneurs, ideation can be a daily process. Start looking around you in your day-to-day life and start identifying problems that could turn into product/business ideas. As you are going through your life, start noticing things that annoy you, things that are bothersome or painful, things that are way more expensive than they should be, things that seem difficult, things that would be cool to have, things that would make society better, things that are unfair, things that would solve a major problem, etc. Instead of (or in addition to) complaining about these things, I want you to make note of them. Write these things down when you notice them. This is the first step in the process of thinking like an entrepreneur – when you notice something, write the thing down and consider how you might turn it into a business. At this point it does not matter if it is a good or bad idea, or a big or little problem that you are noticing – getting familiar with the process of identifying problems is the important thing right now. This is a simple example of a problem, along with a specific product idea meant to solve the problem. But if you think about this, you will realize that there might be a hundred other product ideas that could solve the same problem (the bump could rise rather than fall, a jet nozzle could spray water on the windshield, a giant hammer could come down and almost smash the hood of the car, exotic dancers could appear to inform the driver of the problem, an antigravity field could cause the car to briefly float in the air and then slam back down… There really are at least a hundred ideas we could come up with to solve the “I hate it when speed bumps scrape the bottom of my Lambo” problem). The “problem” and the “solution” are two different things. We are just trying to capture the problems right now. If you are actively looking for problems, you will notice lots of them. I am asking you to start looking at your world, looking for problems, and writing them down as you notice them. In particular, look for “points of pain” – things that are so annoying that people would pay money to relieve them. Write down everything that you discover. Write it down as a note on your smart phone, or in a small notebook you keep in your pocket. Once you get good at this, you might see 2 or 3 things a day to add to your list. Start noticing and writing down ideas today – anything goes. There are no “wrong answers” or “bad ideas” here. We are simply ideating – brainstorming if you prefer that term. We are trying to create a big pool of problems, in order to get the creative juices flowing. Second, I want you to start looking for articles or videos that talk about cool product ideas and cool new companies. When you find them, make a note of them.